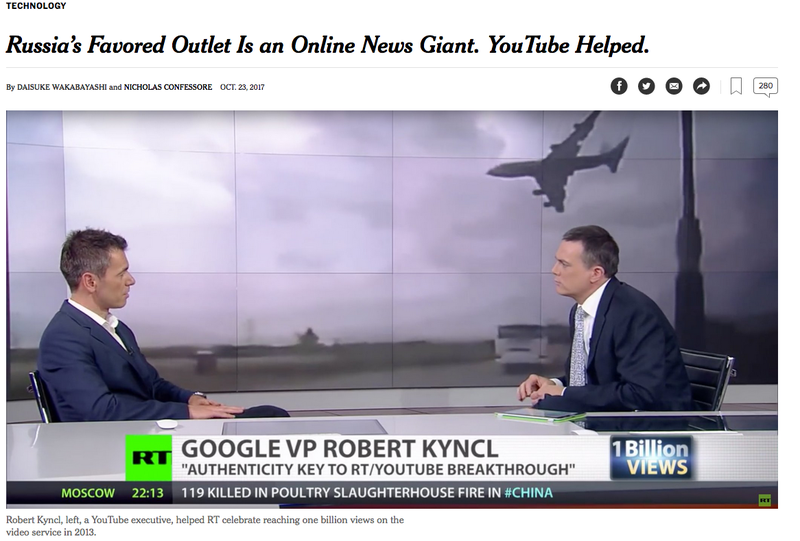 PSYOP Regimental Blog: YouTube Should Be in Your PSYOP Toolkit – It’s in the Russian’s! YouTube Should Be in Your PSYOP Toolkit – It’s in the Russian’s! We all know that a picture is worth 1,000 words. In a previous posting I addressed the trend of video becoming the most powerful and popular means of influence … chiefly through Social Media. The article focuses on the cozy relationship between Russia’s state owned RT outlet and YouTube. I’d like to offer a more personal perspective. As an instructor for American Military University I was asked to develop a course called “Cyber and the Intelligence Cycle”. It was a two pronged course that looked at the use of the intelligence cycle against cyber targets and the use of cyber tools to enhance the intelligence cycle. A requirement of the development was that I had to provide “20 minutes of entertainment” each week for the students. I decided to employ Camtasia a program that allows me to record what’s on my screen (PPT) and a voice over. Then I had set of pretty large files that were often impossible to send anywhere – enter YouTube. I could simply upload the files to YouTube and provide links. A similar situation happened recently when I found myself with a couple of very important video recordings on my iPhone6. A blessing of being an all Apple user is that photos and videos from your phone magically also appear on your iMac. Once that happened it was a simple matter to upload the videos on to YouTube. YouTube also offers several alternative levels of classification so that you can offer some of your work to the general public, but keep some accessible to only select audiences. Oh I would be remiss if I didn’t give a giant Hoo Aah! To my good friends at SOCOM for returning unit designations back to PSYOP. Glad to see y’all had a good does of common sense! Reader input, as always invited. Great article and concept for PSYOP. Well written. Big HOOAH to LTG Tovo for fixing the MISO screwup. PSYOP and soup don't mix.